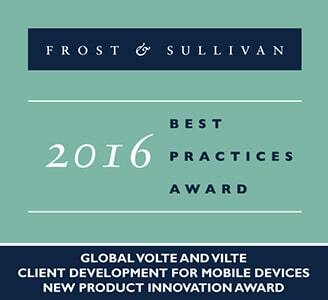 BEEHD Client Framework has been awarded the Frost & Sullivan Global VoLTE and ViLTE Client Development for Mobile Devices New Product Innovation Award for 2016. In naming BEEHD as the recipient of its prestigious award, Frost & Sullivan recognized the ease with which BEEHD can be integrated into any device. Using its user-friendly unified API, the BEEHD Framework supports a wide variety of operating systems, including Windows, Macintosh, Android, and iOS. The Voice and Video over LTE adoption rate keeps growing; as new phones emerge on the market, many clients have VoLTE and ViLTE natively embedded in them. The all-packet-based VoLTE and ViLTE technologies ensure unprecedented audio and video quality to end users, outperforming the popular OTT apps, and becoming a valued player in the communication arena. First deployed by South Korean operators in 2012, VoLTE is gaining momentum globally. As of Q4’2016, more than 80 mobile operators have commercially launched VoLTE services, and several roaming and interoperability agreements are already in place. SNS Research estimates that VoLTE service revenue will grow at a compound annual growth rate of 34% between 2016 and 2020. By the end of 2020, VoLTE subscribers will account for more than $200 billion in revenue. Although traditional voice services will constitute a major proportion of this figure, nearly 15% of the revenue will be driven by video calling and supplementary services. In addition, mobile network operators are adopting VoLTE and ViLTE technologies because they improve users’ quality of experience and are cheaper in terms of $/bit when compared with 2G and 3G. Moreover, it enables reclaiming voice and video market share and average revenue per user improvement. Adapting clients to support VoLTE and ViLTE involves end-user implementation and support of interworking with the mobile core infrastructure. Client development requirements include handling of signaling, registration, authentication, multimedia, quality assurance, a high degree of flexibility to support various MNO requirements, and more. Frost & Sullivan compared the BEEHD Framework with two other platforms. The BEEHD Framework beat its competitors on all performance indicators. The award is another proof point for using BEEHD for VoLTE development, following announcements earlier this year on Elbit and Foxconn, counting several million devices that already use BEEHD’s VoLTE and ViLTE. To read more about the BEEHD Framework receiving the F&S award, follow this link.